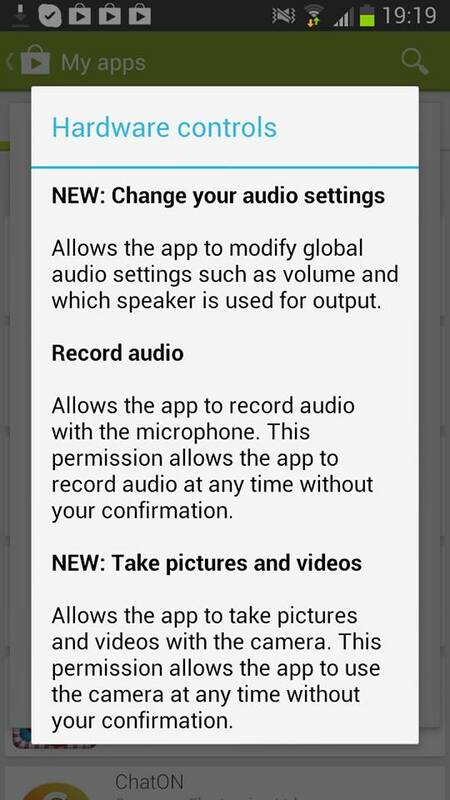 The update for the Google Chrome mobile app for Android needs to obtain the permission of the user to a new clause in the Terms and Conditions for its functioning, under “Hardware controls”, which raises extremely serious privacy concerns: if granted, the updated app will have permission to record audio with the microphone at any time without the user’s confirmation and also take pictures and videos with the camera at any time without the user’s confirmation. Does this mean that the telephone conversations can be recorded at Chrome’s will whenever the app runs in the background? Does it mean that it can also record sounds from the phone’s surroundings, again, at Chrome’s will? Does it mean that at “any time” the camera of the phone can start, at Chrome’s will, to record anything out there? Where are these recordings stored? Who has access to these recordings? Does the user even find out such recordings are/were happening? These are questions which need answers. The words in the terms and conditions for the updated app were very few. And worrying. As this blog post starts from a personal experience, unfortunately I do not have more information on this issue. I don’t know whether such a clause already exists in the Terms and Conditions of other Google Apps, or other apps, but I find it almost unbelievable (under the terms the clause was expressed in). “At any time” is a very powerful legal description of a context, as it basically encompasses every possible time and situation. “Without your confirmation” is another powerful wording, as it suggests that the user can be literally spied on. Needles to be said, such an approach breaks at least several provisions of the EU Data Protection Directive (and the national implementation laws, obviously), such as the lawful basis for processing rules, the right of the data subject to be informed, purpose limitation rules. As I am not a techy, I have no idea which are the technical conditions for a mobile app to be able to take photos and video/audio record with my phone without me knowing when it does so. It might not even be possible. But if it is not possible, why is Google Chrome asking me if I allow it to do this at any time, without my confirmation? And if it is possible, why on Earth does Google Chrome need to take photos with my camera and record sounds and conversations with it? I looked at the specifications for what the updated version of the app brings new and nothing looks like the app needs photos, video and audio recordings to function. Under “What’s new”, Google writes: * full screen on phones – Scroll to hide the toolbar, * simplified search – View and refine your query directly in the omnibox, * tab history on tablets – Long press the browser’s back button to view your tab history, * several stability improvements. That is all. Perhaps audio recordings help with the stability issues? (kidding). Therefore, if any of you, frequent or occasional readers, can enlighten me on any of these issues, I will be grateful. 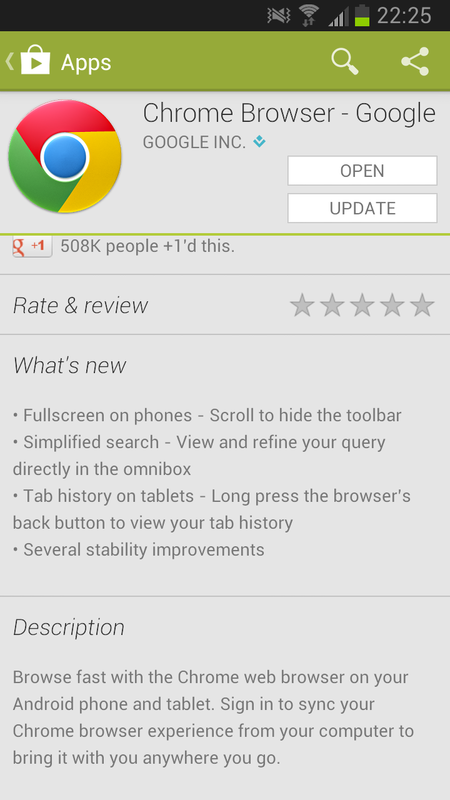 In the meantime, I have not updated the Chrome app on my phone. Reuters writes that Spain’s highest court wants the top court in Europe to decide if requests by Spanish citizens to have data deleted from Google’s search engine are lawful, in a case that could put more pressure on it to review its privacy policies. The court, the Audiencia Nacional, said it had asked the European Court of Justice (ECJ) to clarify whether Google should remove data from its search engine’s index and news aggregator even when it is not responsible for producing the content in its search results. Madrid’s data protection authority has received over 100 requests from Spanish citizens to have their data removed from Google’s search results. Among the cases is one of a Spanish man who complained to the national regulator about a notice of his home’s repossession for non-payment of social security, which kept appearing in a national newspaper in the Google News aggregator. In another case, a plastic surgeon wants to get rid of archived references to a botched operation. The Spanish judges also asked the ECJ whether the complainants must take their grievances to California, where Google is based and said it wanted the matters heard. The referral of the case to the ECJ marks the first formal inquiry into when people can demand that their data be deleted. Personal note: this is one interesting case. If dealt with properly by the CJEU, than we will have the first reference to the concrete ways to enforce a right to be forgotten. I’m really eager to see its outcome. The preliminary question I find particularly interesting is the one referring to the quality of the information required to be deleted from search engines. “Finalmente, los jueces preguntan al Tribunal de Luxemburgo si la protección de datos incluye que el afectado se niegue a que una información referida a su persona se indexe y difunda, aun siendo lícita y exacta en su origen, pero que la considere negativa o perjudicial para su persona”, which means that the Spanish court has asked whether the data subject can ask for data to be deleted even in the case the information is legitimate and true, but the data subject considers it to bring prejudices. Read the rest of the story HERE and HERE.